What is connection between astronomy and cooking? An interesting notion. 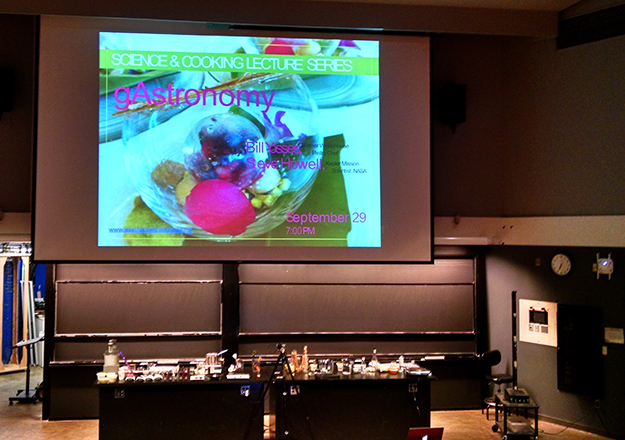 And for me, an irresistible draw to the Science and Cooking lectures at Harvard. A series open to the public and based on the class offered to the students of the College, it brings together world-class chefs and scientists to do live demonstrations of Modern Cuisine and talk about what really happens on a molecular level when you melt chocolate, boil pasta, or make gravy. Part magic show, part deep intellectual endeavor, this series has captivated the crowds that have packed into the Science Center for the past few years. I faithfully attended most of them the first year, but due to tumultuous upheavals and schedules, it was an unfortunate casualty of lost hobbies while I brought my life back to an even keel. (And there is consolation in that the videos are archived online.) 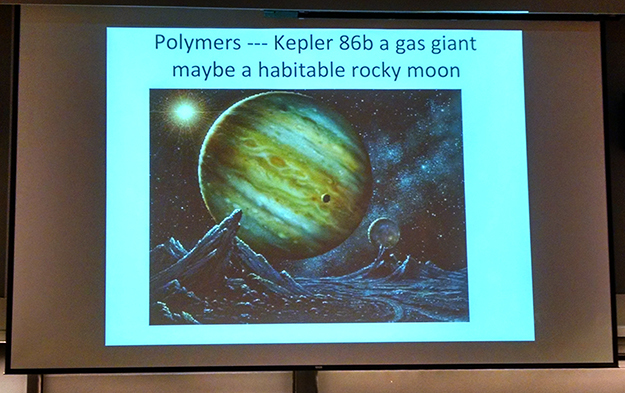 It’s a delight to be able to return to them, and what better way than to attend a lecture that blends two of my favorite subjects: cuisine and astronomy. Bill Yosses, former White House pastry chef, and Dr. Steve Howell, project scientist for the Kepler and K2 missions at NASA, are the instructors I wish I had in high school. Instead, I was alienated from chemistry and physics because the teacher spent every class being the cool kids’ smart-alecky buddy, making dumb jokes and telling anecdotes about kids’ parents who were in his class a generation before. Not a townie, and a perpetual outsider, I attempted to decipher the massive text book on my own, only to fail each brutal test that came with no help whatsoever. I hated to hate science, but it was the byproduct of a deeply flawed educational experience. At least I was able to turn that around as an adult. 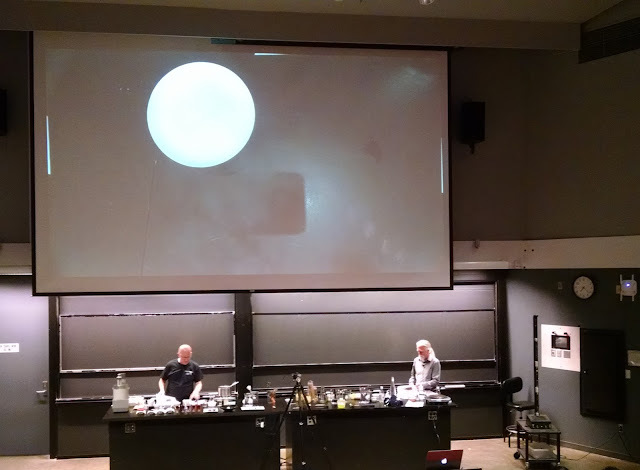 An old sense of tension dogged me while Bill Yosse and Steve Howell tossed out terms like “nucleation” and “Raleigh scattering.” But with the colorful array of objects on the table at the front of the lecture hall, I knew this would be a different experience. Nucleation was demonstrated by a beaker partially filled with hydrogen peroxide, dyed with red food coloring to clearly show the dramatic effect of the addition of potassium iodine (used to seed clouds for rain). An oxygen molecule was ripped from the hydrogen peroxide—H2O2 to H2O—making it water. The reaction was a colorful spout of foam shooting at least six feet into the air before landing in a messy heap on the table. The beaker was hot to the touch. As they stepped through each example: spherification, surface tension, atmospheric pressure, and so on, I was astonished by the links between cooking and astronomy. Gels and polymers, essential to many desserts and a key element of Modern Cuisine, where flavors are layered in unusual ways—are also used in similar ways in space, from insulating instruments on the Mars rover to using a gel to catch particles from passing comets. Suddenly, I got it. So much of the science that bewildered me years ago made perfect sense. It was really a kind of nirvana—seeing these two topics combined—and a few details emerged that will most certainly find their way into my fiction. How flames look in zero gravity or the fact that a lower density atmosphere means a lower boiling point (demonstrated by water being boiled as an ice cube was placed on the beaker) are great for the novel that involves space travel. Even the explanation of the spectrometer and Kepler mission—how we find planets and figure out what gasses their atmospheres are made of—is useful knowledge for my characters to have. Then Bill Yosse mentioned one of the world’s first (at least that we know by name) celebrity chef, Antonin Carême, who cooked for kings and czars around the time of the French Revolution. While outside of my usual theme of writing about real women in history, tales of his elaborate pièces montées, large sculptures used as centerpieces at banquets, made of marzipan and other ingredients, sparked something. I have no idea how this will transform into my writing, but visions of his creations invited a new Muse into the realm of imagination. As for the science and cooking lectures, I look forward to more. All the details about the series can be found here.